Onion, Onions, Radish, Spring Onion and Potatoes. Sow direct into soil when it has warmed up from mid spring onwards. Takes a couple of weeks to germinate. Thin out when the seedlings are large enough to handle if they are too close. Weed carefully during early stages. 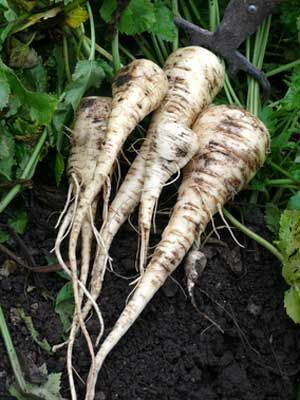 Cover with mesh or fleece if carrot fly has been a problem in the past, although parsnips are less susceptible to this. Use a garden fork to loosen soil along outside of the planting before pulling roots. Can be left in the soil through winter in many areas.